The U.S. Geological Survey (USGS) recently completed a comprehensive assessment of in-place oil in oil shales of the Eocene Green River Formation of the Uinta Basin of eastern Utah and western Colorado. The oil shale interval was subdivided into eighteen roughly time-stratigraphic intervals, and each interval was assessed for variations in gallons per ton, barrels per acre, and total barrels in each township. The Radial Basis Function extrapolation method was used to generate isopach and isoresource maps, and to calculate resources. The total in-place resource for the Uinta Basin is estimated at 1.32 trillion barrels. This is only slightly lower than the estimated 1.53 trillion barrels for the adjacent Piceance Basin, Colorado, to the east, which is thought to be the richest oil shale deposit in the world. However, the area underlain by oil shale in the Uinta Basin is much larger than that of the Piceance Basin, and the average gallons per ton and barrels per acre values for each of the assessed oil shale zones are significantly lower in the depocenter in the Uinta Basin when compared to the Piceance Basin. These relations indicate that the oil shale resources in the Uinta Basin are of lower grade and are more dispersed than the oil shale resources of the Piceance Basin. 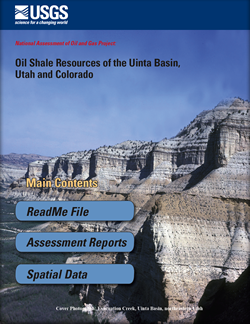 U.S. Geological Survey Oil Shale Assessment Team, 2010, Oil shale resources of the Uinta Basin, Utah and Colorado: U.S. Geological Survey Digital Data Series DDS–69–BB, 7 chapters, pages variable.